JEJU -- Geological experts from South Korea, China and Japan agreed Tuesday to conduct joint research on major faults of the counties to better estimate earthquake risks. 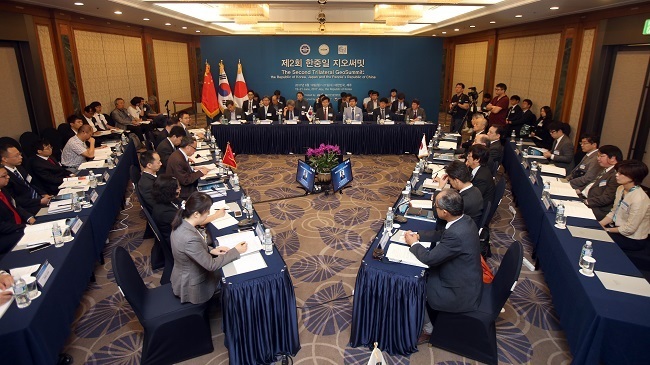 The agreement came during a meeting of the Korea Institute of Geoscience and Mineral Resources, the Geological Survey of Japan and the China Geological Survey on South Korea's largest island of Jeju. The Trilateral GeoSummit meeting brought together 80 experts and officials from the three Northeast Asian countries. During the meeting, Yang Houlan, chief of the Trilateral Cooperation Secretariat, stressed the importance of research cooperation for sustainable development of the region. The experts discussed the issue of active faults, which drew attention in South Korea last year, when the country experienced its strongest earthquake ever in Gyeongju, some 371 kilometers southeast of Seoul. They agreed to implement the joint research on the Yangsan fault in South Korea, the Tan-Lu fault in China and an active fault running through the middle of Japan's main island of Honshu. It marks the first time for the three countries to conduct a joint research on the field of geology. The three countries also agreed to continue cooperation in extracting and commercializing natural gas hydrates, a chemically stable crystalline substance that resembles sherbet. The Chinese side gave a presentation on its extraction of samples of natural gas hydrate for the first time in the South China Sea, while South Korea's Trade, Industry and Energy Ministry formed a business cooperation deal with the China Geological Survey on the research, development and production of natural gas hydrates.